Overpopulation of geese particularly Canadian and Greylag geese, are a familiar problem for many water owners and operators. 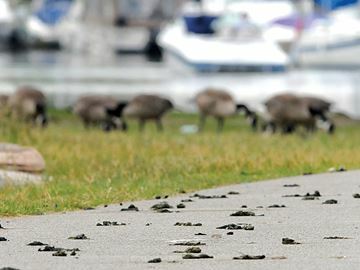 These problems include nutrient enrichment of the water causing water quality deterioration, large quantities of goose faeces littering pathways and access points, and aggressive birds attacking people and pets when protecting their young. On many private waterways these species can be easily culled but on many public lakes and ponds this is not an option and other control methods need to be explored. There are several options that can be employed to control geese particularly where shooting is not an option. Geese can either be directly collected at certain time of the year or their eggs treated and removed during breeding season. There are also other methods that can be employed and to some extent, planting schemes and habitat alterations can be employed to make the habitat less desirable for geese. We have significant experience of treating eggs with mineral oil to stop the eggs hatching. Under license from Natural England this has been deemed the most humane way to control numbers. Please speak to us if you would like to use this service as licences are issued individually for each water and problems with the species will need to be verified on site, usually with an inspector from Natural England present. We can assist with the whole process and work with you to ensure that geese populations are managed and, ideally, reduced.